Due to the reflection process, it took 15 minutes for us to get to the first date. I always feel the guy respects the girl who gets the fantasy suite a little more than the rest, or at least wants to give her first dibs. First tweet that made it. Lindsay said she would do anything except for eating bugs. I can think of a million other things I wouldn’t want to do. Poor girl looked like she was going to barf everywhere. Sean says, “You are the best friend I am looking for.” Oh those words always haunt people at rose ceremonies. They make out a lot for “best friends.” Next, they feed monkeys on the beach and I just hope those monkeys had the same psychological evaluations as the contestants. It would be awkward about the time a monkey eats one of their faces off. Thanks guys, it was about to get serious. At dinner, they eat at the Asian version of an epileptic seizure. I really like these two together, Lindsay was so close to telling him how she felt and then a loud dancing band showed up. She tells him she loves him, they kiss and his response was “I love hearing you say that.” Oh the dagger into the heart. This starts will a Jack and Rose style pose. Sean is rocking the Ray-Bans and I’m unclear of what movie we are watching. Riding along all of those tall rocks I would be petrified, have no fear, they are not rock climbing. Instead, they are going through a dark cave. I would be terrible for this show, because I would demand another route. I’m a terrible swimmer and would die if I couldn’t see what was under me. Is that a metaphor I see? I kind of love that AshLee started spewing ring facts. She has her priorities in order and Neil Lane getting all warm at home. It would have been ever better if she said, “you better not get it from Jared.” Sean can now write healer on his résumé. I really like Catherine and bless her hair, she is the first to fall victim to the tropical humidity. She still manages to look amazing. If you beat the humidity, you can face anything. I knew someone would post my tweet about the humidity. Lindsay had to eat bugs, AshLee had to go in a dark cave and Catherine has to take a chance with electrocution. Nothing says safe like cruising on water during lightning. My tweet made an appearance during the fantasy suite card sharing. Catherine talks about how she can see herself married to Sean and with a kid, within the next five years. He looks like he just saw Jesus. Sean hears lady, time and fantasy suite, and looks like he just had a protein shake. He is happy she is nervous about the fantasy suite and I wonder if he has been praying or preying. I really like how humble Catherine is and she likes to eat a lot. Forget those people who have made fun of her, I love to eat too. Sean calls her “smoking hot” and it is impossible to make me think they went in there and played scrabble. More power to them, it must be rough to be so attractive and cool. This wouldn’t be The Bachelor without a reflection process with Chris Harrison. He talks with Sean about if he is in love. Nothing brings clarity like fantasy suites and looking at BIO photos. Sean sees Lindsay’s video and looks beyond happy, how cute is she? Catherine had me sold at wiggles, that girl is hysterical. I feel like she had more time than the rest, no? AshLee is rocking a ponytail and I am already worried, mostly because her hair is always flawless. She is crying and I feel like she knows she is going to get the boot and not in a fashionable Frye book kind of way. 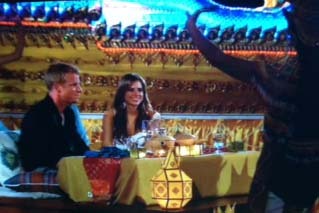 Lindsay got the first rose and then the biggest pause of all time occurs and he chooses Catherine. AshLee is furious and I mean who could blame her or him? If I ever learn to play poker I totally want AshLee on my team. Saying her face and composure were perfection is the biggest understatement ever. The remaining girls look out the window, wondering if he is going to do the Mesnick. This almost never happens, but I love all of the final three, even the final four were amazing. I think AshLee or Lindsay would make a fabulous Bachelorette. I don’t think anyone in the top four will say no, so I don’t think it will be Lesley. I believe Sean is in love with all of the girls or at least thinks he is in love. He cannot go wrong in this situation. What do you think? Who would make the best Bachelorette? If you aren't already, you can follow me on Twitter, @BachelorExpert.